My HTC Desire and 7” Samsung Galaxy Tab went on ebay at the end of 2011 to fund my purchase of an Asus Transformer Prime. Through a £499 pre-order on ebuyer.com, I was lucky enough to receive this amazing Android tablet a few days before the official UK release and have now had a week or so to play about with it. Here are my impressions! The UK version of Asus Transformer Prime is the 32GB Prime + Dock combo, tightly packed in a single box with a charger and cable. Docked together, the Prime was a little heavier than I expected, no doubt due to the additional battery in the dock and the counterweights below the keyboard to stop the whole thing toppling over. On its own, the Prime tablet is pretty light and feels like a solid, premium device in the hand. The design tends to make you hold it landscape (as opposed to an iPad’s portrait design), which means your right hand can easily cover up the single speaker. I also found that my microSD card wasn’t flush to the chassis and tended to stick out by a few millimeters. Not much, but enough to slightly spoil the smooth tapering of the Prime’s edges. Minor gripes aside though, the overall look and feel of the Prime is one of class and quality. I opted for the Amethyst Grey version which in reality is more a light shade of purple. Purple Prime, docked and closed. It's an Android ultrabook! After logging in, the Prime immediately prompted me to download an update aka Ice Cream Sandwich. 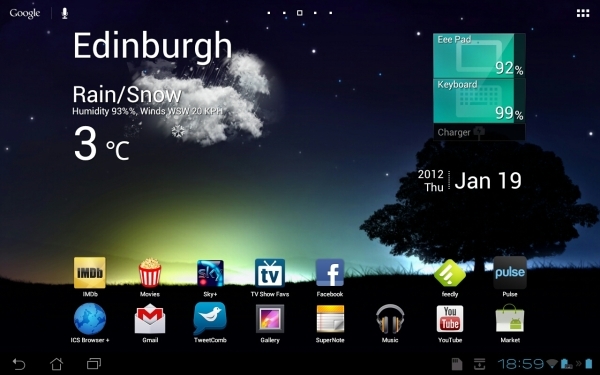 My Galaxy Tab ran Gingerbread, so I’ve bypassed Honeycomb completely in my Android user experience. ICS is very intuitive and easy to just pick up and use: swiping from screen to screen is fast and (for the most part) stutter free, as is jumping to the App drawer. Despite the quad-core CPU, there’s still the occasional delay switching if you’ve been running a few apps, and there’s a noticeable delay when navigating within the YouTube app. The ICS browser is very good, especially as it now finally syncs bookmarks with Chrome on the desktop. I did however switch to ICS Browser+ so that I could set the user agent to Desktop and make all web pages the “full” version rather than mobile versions. My fairly standard homescreen. I like how this live wallpaper changes depending on the time of day. I tested out a few other peripherals: my PlayStation 3 controller worked fine when plugged into the USB port on the keyboard (tested with Grand Theft Auto III), although I couldn’t get an Xbox controller to work. USB flash sticks and mice all work plug-n-play style, but like a PC you need to “unmount” memory devices before physically removing them. There’s a one-click option to do this in the notification area, but I forgot one time and ended up with a blank SD card. The Prime reads NTFS-formatted drives no problem, so you can copy huge movie files for offline viewing. 1080p video output from the Prime to my Sony Bravia. 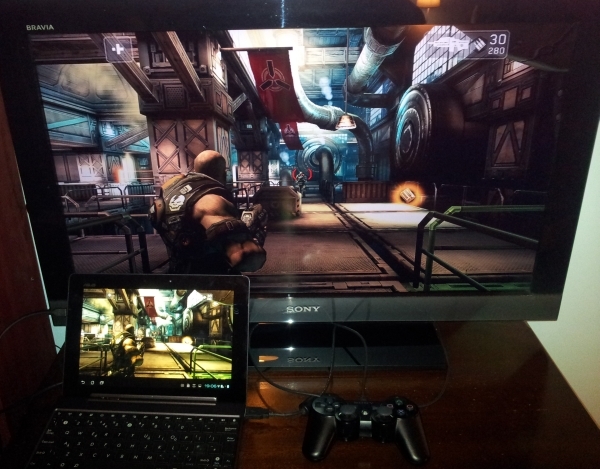 Playing Shadowgun THD with the PS3 controller is a bloody joy! Some of the apps bundled by Asus are actually very good indeed: I was particularly impressed by the bundled Splashtop Remote Desktop app that lets you remote view and control a PC. Resolution is top-rate and there’s almost no lag at all. You may have seen videos of the Prime “running” Skyrim – this is how it’s done. Note that you need to install the Splashtop server on your PC first, and on the Prime it’s called MyNet instead of Splashtop. The bundled DLNA/UPnP media streaming app is also very good, way better than the Samsung equivalent. It picks up the devices and navigates through folders very fast. I installed the free app UPnPlay as a backup, as well as DICE Player for the odd MKV that played with no sound in the stock player. The Prime comes with the Google Music app pre-installed. At first I thought this was a mistake, since Google Music is not yet (officially) available in the UK. But of course it acts as a local music player too (duh). Splashtop Remote desktop session to my Windows 7 PC. 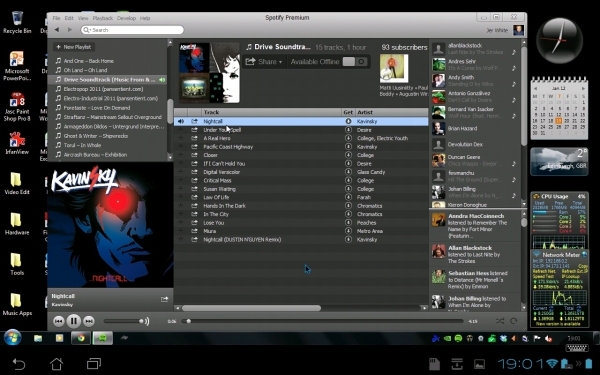 Finally a decent Spotify app on Android! 😉 The sound comes out of the Prime too. Games on the Prime take mobile gaming to the next level. There aren’t too many out yet that take full advantage of the Tegra 3 processor, but the ones that do (search for “THD”) all look jaw-droppingly good. Console quality? Well, not quite but it’s getting close. Better than PS2 for sure. The ability to plug in a PS3 controller and connect the Prime to a TV makes this a perfect second games console. I installen Beansoft’s Thumb Keyboard as I found typing on the stock virtual keyboard almost impossible while holding the Prime in landscape. Thumb Keyboard splits the keyboard into two and works a treat with almost no training time at all. Tablet-specific apps are still a bit thin on the ground, but I found Flixter Movies, IMDB, Feeedly and Pulse all take advantage of the tablet form-factor. TweetDeck looks awful on the tablet (almost as bad as the Spotify Android app), so I opted for TweetComb instead. This has columns and looks like TweetDeck on the desktop. There’s been a lot of complaints about the WiFi and GPS on the Transformer Prime. Personally I think GPS on a tablet is almost as pointless as a camera, so I’ve not even bothered checking it. I did do some WiFi tests and am happy to say that I’ve not experienced any problems. I have 30Meg broadband and with the Prime in the same room as the router, I get a consistent 29Mbps on WiFi (my Samsung Galaxy S II gets about 20Mbps). In my bedroom (on the same floor as the router but through a couple of brick walls) I get around 15Mbps on WiFi for both the Prime and the GSII. 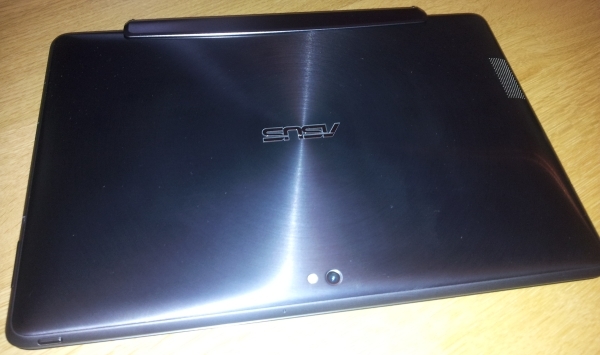 The Asus Transformer Prime is as near as possible the perfect tablet for 2012. The Prime’s speed, display and overall design is superb and everything I’d hoped for from a quad-core mobile machine. I don’t have a laptop so with the combined dock this is the only mobile computer I need. The bugs and problems I’ve encountered so far are minor: I’ve experienced the occasional screen “jitter” (where the image jumps up and down for a fraction of a second) but this is rare. The stock ICS browser was perhaps a little bit laggy, but I’ve now switched to ICS Browser+ and find this a bit smoother. A couple of times I found that I couldn’t type on the dock’s keyboard automatically, but I think this was due to my 3rd-party Thumb Keyboard app confusing it. But these are minor issues, none of which comes anywhere near to spoiling my satisfaction with the Transformer Prime. Its unique design means that unlike the Samsung Galaxy Tabs, the Prime can be be called an iPad wannabe. So I will take Asus up on their kind offer to extend my warranty but there’s no way anyone’s gonna prise this Prime outta my hands!